A pioneering police boss is aiming to use £30 million in buying power to enhance the lives of communities across North Wales. 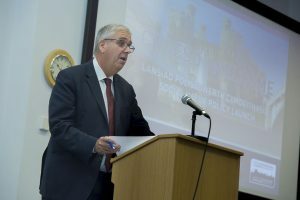 North Wales Police and Crime Commissioner Arfon Jones made the pledge during the official launch of his new social value policy. He is the first police and crime commissioner in Wales to introduce such a policy. This aims to see public bodies, such as his office and North Wales Police, buying in services in a way which is not necessarily the cheapest but pumps extra cash into the local economy and boosts employment and volunteering opportunities. 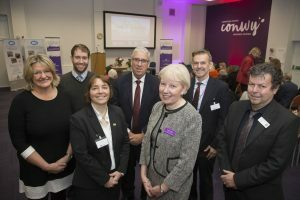 The launch event, hosted by Mr Jones at Conwy Business Centre, was attended by over 30 suppliers and representatives of organisations which already benefit from social value schemes, including a number directly supported by his office. In his introduction Mr Jones said: “My vision is to lead and work with the North Wales public sector in embracing social value, which follows on from two pieces of legislation, the Public Service Act of 2012 and the Welsh Government’s Well-being of Future Generations Act of 2015. “It is about building an enhanced and strengthened local economy, creating economic growth, jobs and opportunities for local people. He added: “It is important to note that this is a move away from awarding contracts at lowest cost and is of extra significance given the increased pressures on public spending we are having to deal with across all sectors. The PCC said that in line with the spirit of the conference on modern day slavery he had hosted recently and would ensure that everyone involved in the chain of supply to his own organisation and North Wales Police adopted practices that are free from unethical trading and human rights violations. Launch of Social Value Policy at Conwy Business Centre. 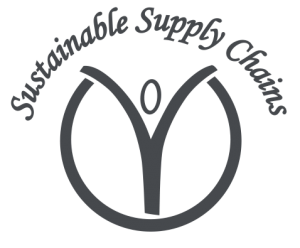 Pictured is speaker Stuart Davies, Sustainable Supply Chains Ltd.
One of the keynote speakers at the launch event was Stuart Davies, director of specialist company Sustainable Supply Chains Ltd based in Buckley, Flintshire, who devised the new social value policy for the PCC. He said: “Every pound spent locally can generate local community good and research shows that if the 687,000 people who live in North Wales all spent £50 a year with local suppliers an extra £34.3 million of income would be generated for local economies. “Social value can benefit people through the creation of work and volunteering opportunities, increase local spending and also improve health and well-being. “However, we have quite a way to go as currently less than 25 per cent of councils have a social value policy. “The policy I designed for the PCC and North Wales Police is based on my Social Value Wales strategy and will now be applied to every contract, in two categories above and below £50,000. 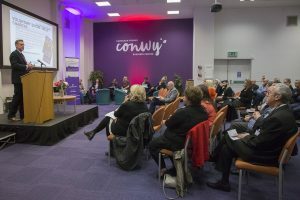 Another keynote speaker, Gwynne Jones, managing director of the Cartrefi Conwy housing association, said his organisation had identified social value as a key policy from its earliest days. “For instance, we have always believed that our job is not just about bricks and mortar and we think it is very important to maximise procurement to increase training and work experience opportunities in the construction sector,” he said. “In the last financial year we had major projects worth £15 million which helped to create local jobs and support local people in terms of their aspirations and hopes. Pictured are (front L/R) Ann Woods, Flintshire voluntary council, Tracy Martin, NPCC Director of finances and resources, Susan McTaggart,Acting Chief Executive Office of Police and Crime Commissioner North Wales Police, Dave Evans, PACT, Tom Edwards, Contract Manager, Victim support, Arfon Jones PCC and Stuart Davies Sustainable Supply Chains Ltd.
“About 18 months ago we founded an organisation called Creating Enterprise, which was a step-change in the evolution of our organisation. “This not only created a maintenance contractor for ourselves and others such as the local NHS and St David’s Hospice but also an employment academy which aims to get our own unemployed tenants back into the workplace. Also highlighting the benefits of social value was Dave Evans, project manager for the Police and Community Trust (PACT), a registered charity supporting community initiatives, particularly those involving the police, which aim to improve the quality of life by reducing crime and fear of crime in the North Wales communities. He outlined a range of social value schemes PACT had promoted including Your Community Your Choice which is backed by cash from the office of the Police and Crime Commissioner. Mr Evans said: “The scheme is based on the principle of money confiscated from criminals being used to make cash grants to community schemes which help to fight crime and anti-social behaviour. This is now in its fifth year and going from strength to strength. “We have also promoted other successful schemes based on social value such as Think Before You Drink, which aimed to tackle underage drinking, and Justice in a Day, to educate schoolchildren on the consequences of becoming involved in crime or anti-social behaviour. At the end of the launch event, Arfon Jones said: “It has been a very useful and interesting day and I am grateful to everyone who attended for their support.